URW157 Fear not for I have redeemed you (Jodi Page-Clark) A pretty straight-forward rendering of Isaiah 43, with a very simple chorus. Some lyrics and chords. NCH604 / MV167 Hush hush somebody's calling my name (Traditional African-American) I really like this song. I'm not sure how it would work as a congregational song, though, since I've never been in a congregation that has sung it. I know some musicians who would love to sing it though - especially that deep "Hush" bit. Lyrics & sheet music samples. Scripture in Song 505 Fear not for I am with you (Phil Pringle) An old scripture in Song one. I still quite like this - great for big and little kids. It's essentially a paraphrase of the reading. I especially like it when everyone yells out "No way!" in between "We will not" and "be drowned"…. I'm such a dag. Good for kids Lyrics and chords. AoV1-114 / HPP376 / G(II)430 / GC608 / GC(II)596 / G(3)683 / W&R430 / Lau964 You shall cross the barren desert / Be not afraid (Robert Dufford) Beautiful words. Well known (at least, the chorus). Verses may be tricky. Lyrics. Taizé / GtG243 / G(3)516 Be not afraid sing out for joy / Nebojte se (Jacques Berthier) Happy joyful Taizé chant! Sheet music and sound samples. Good for kids. MV161 I have called you by your name (Daniel Damon) Easy, natural tune and good words about having courage to follow where God leads. Lovely words of everyone's innate value in God's eyes, and a simple and lovely tune to sing; also quite good for commissioning or ordination services. Sheet music and lyrics. Hillsong United When you pass through the waters / Isaiah 43 This is quite a nice chorus - fits the reading well. It's not easy to sing at first. Would be better sung by a choir, or teach the congregation one of the parts in the chorus. Quite anthemic. Video with sound sample. Lyrics and chords. TiS 468 / NCH309 / PH436 We are your people Spirit of grace (Brian Wren) I really like the lyrics to this one. The tune is a bit funny and the hymn is quite long - needs something to stop people plodding through it; maybe split the singing into male/female or different sides of the congregation. Sheet music and lyrics. God's voice in the thunder. Quite a thunderous Psalm! Wind and flame, earthquakes and floods. AoV1-190 / UMH431 / HPP308 / G(II)529 / GC731 / GC(II)723 / G(3)829 / W&R614 / Cha677 Let There Be Peace on Earth and let it begin with me (Jill Jackson-Miller and Sy Miller) Great for older kids. AoV changes "Brothers all are we, let me walk with my brother" to "We are family. Let us walk with each other". Good for kids. Lyrics. TiS 465 / AHB 399 / ATA 115 / NCH279 / A&M271 / Iona (SBL) / CH116 / GA381 / Lau313 / StF004 Our God in heaven / Father in heaven / Loving Creator grant to your children (Elena Maquiso / Daniel Niles) I really like this hymn, especially the Philippino folk melody to which it's set. Newer versions of the hymn from the Christian Conference of Asia have altered the lyrics to "Our God in heaven / Creator God" in the first verse. Other versions, such as CH4 have "Loving Creator / Parent and God". Older version of lyrics. *NCH Psalter 29 The voice of God is full of majesty (Bob Hurd). A very simple and beautiful refrain with a paraphrase of the Psalm that is inclusive without losing any of the majesty of this Psalm. Can be used with a reader or cantor. Highly recommended. AoVK-123 / NCH3 / Iona (M&G) / UMH148 / VU308 / WoV794 / ELW837 / GtG021 / PH271 / G(II)338 / GC499 / G(3)911 / CP407 / W&R26 / Cha58 / URW232 / 82Hml-385 Many and Great O God are your works / Wakantanka Taku Nitawa (Philip Frazier) Good words. Simple tune. Sounds great accompanied by a good Native American-style drum beat, which is a great way to get people (especially kids) involved in music-making. Lyrics here. TiS 447 / AHB 61 / CH112 / VU313 / LBW400 / ELW673 / A&M810 / CP560 / CP(E) 267 / 82Hml-371 / Lau887 / StF106 / MP699 God whose almighty word / Lord your almighty word chaos and darkness heard / Thou, whose almighty word (John Marriott) A good hymny hymn, very familiar, with the memorable “Let there be light” line at the end of each verse. TiS lyrics are fairly inclusive, but VU is better. Oldy-but-a-goody. Lyrics. 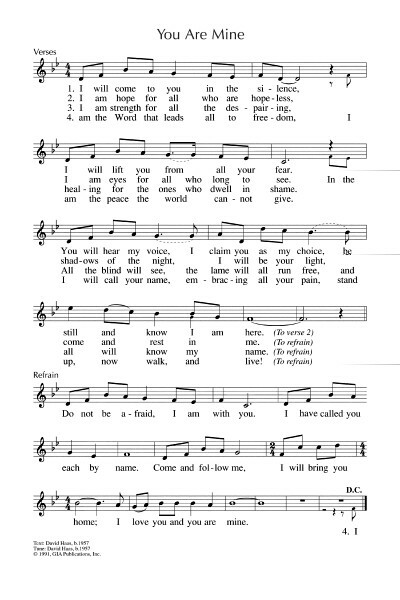 TiS 753 / ATFG558 / StS034 / R185 / ELW525 / SP&P082 You are holy you are whole (Per Harling) A fun and joyous latin-rhythmed song; can also be sung with two parts at the same time. Lyrics. Good for kids. *NCH462 / UMH109 / VU265 / WoV757 / ELW684 / PH134 / GC580 / RS711 / CP410 / W&R32 / Cha335 / URW067 / 82Hml-384 Creating God Your Fingers Trace (Jeffery Rowthorn) A good Trinitarian hymn about Creating, Sustaining and Redeeming God. There are many possible tunes. I like the Presence tune better. Lyrics and a sound sample. AoV2-089 / Taizé / MV086 / SFFS 2156 Give peace to every heart / Da Pacem Cordium (Jacques Berthier) A good, simple Taize chant. Sound samples, sheet music (not cantor lines though). PfAS029D Your voice O Lord is a voice of splendour (Martin Tel) A very simple Psalm refrain. TiS 569 / AHB 478 / NCH18/19 / CH167 / UMH127 / VU651 / LBW343 / ELW618 / StF465 / A&M652 / HPP432 / GtG065 / PH281 / CP565 / CP(E) 455 / W&R501 / Cha622 / 82Hml690 / StF465 / Lau960 / MP201 Guide me O thou great Jehovah / Redeemer (William Williams) A rousing hymn of God’s presence and strength and making it to the other side. "Bread of heaven, feed me now and evermore." Sound sample, lyrics and sheet music. Oldy-but-a-goody. Tune In / Online Resource Alive in me (Sheree Anderson). “Spirit of the Father, spirit of my brother, spirit of the living one alive in me. Spirit of the Mother, tenderhearted lover, wisdom to discover alive in me”… etc. A good upbeat song. Lyrics, sample and free downloadable songbook. TiS 421 Where the Spirit is there's freedom (Per Harling) Fun and good; excellent fun for the pianist! Good for kids. Can be sung with the congregation in two halves singing each part, which is not too hard once they have the hang of singing it in unison. Lyrics. TiS 412 / AHB 324 / ATE 251 / G(II)328 / GC468 / CP651 / W&R130 God sends us the Spirit to befriend and help us / Spirit Friend (Tom Colvin & people of Malawi) I like this song from Malawi, but the lack of inclusive language for God in some versions drives me a bit crazy. In Tom Colvin's book "Come Let us walk this road together" he uses more inclusive language. That is, he writes “God sends us the Spirit” instead of “God sends us His Spirit” and "Spirit of our Maker" rather than “Spirit of our Father”. Lyrics and sheet music. TiS 710 / CH758 / Iona (Enemy of Apathy) / VU204 Come Holy Spirit gracious heavenly dove (John Bell) A beautiful and simple chant. AoV1-043 Breathing now the life of God / Warm Our Hearts (Jane Marshall) Simple round. "Breathing now the life of God the Spirit in us singing, come light up our hearts with joy! Heal and clear our eyes to see! Warm our hearts with peace. Warm our hearts with peace.” Short songs like this are great for kids. When teaching a song that breaks into a round, it’s best to work with as little accompaniment as possible; no accompaniment is best. Good for kids. TiS 270 / AHB 199 / NCH115 / CH334 / VU20 / LBW548 / ELW842 / A&M046 / GtG096 / PH010 / G(II)260 / GC321 / 322 / GC(II)344 / G(3)418 / CP103 / CP(E) 34 / W&R156 / 82Hml-076 / Lau094 / StF182 / MP538 On Jordan's bank the Baptist's cry (Charles Coffin) If you would like inclusive lyrics, have a look at the New Century Hymnal’s version. If you’d like a groovy tune, check out AHB 199(ii) / GC322 – ST JOHN BAPTIST by Gary Lewis Miles and Betty Pulkingham. This is an excellent, fun tune. You can even combine the words of NCH115 with AHB199(ii) for the best of both worlds. But WINCHESTER NEW is also very good, and easy to sing if you don’t have a congregation full of people who grew up in the 60s and 70s. Lyrics and sheet music samples. Oldy-but-a-goody. GtG164 / CP045 Down Galilee's slow roadways (Sylvia Dunstan) Good words for adult baptism, or for any Sunday that reflects on Christ's baptism. TiS 419 / NCH270 / CH592 / A&M252 / UMH544 / VU205 / WoV685 / ELW403 / HPP222 / GtG285 / PH314 / CP635 / CP(E) 185 / W&R327 / SP92 / 82Hml-513 / StF389 Like the murmur of the dove's song (Carl P Daw) Excellent words and a simple tune about Christian unity. Each verse ends with "Come holy spirit, come". Sheet music sample. *NCH285 / CH591 / SFFS 2123 / URW164 O Holy Dove of God descending / Spirit now live in me (Bryan Leech) Lovely simple tune, and beautiful words. Lyrics. CH335 Out of the flowing river (Leith Fisher) Beautiful simple words of the Baptism of Christ with a call to go out and make the love revealed in Christ known through the world. A simple tune, but it will need to be taught. ATOK 344 You who puzzle on the Saviour's deeds / New Road (John Beavis) A good song for older kids. Especially for Australian older kids. Lyrics (maybe more verses than you need!). Good for older kids. What will you be singing? Join the conversation and share your thoughts in a comment below. We have frequently sung "What Was Your Vow and Vision." (Chalice 177) Still trying to decide whether to use this as the closing hymn for tomorrow!